Lenders Mortgage Insurance is a one-off insurance premium that you have to pay to your mortgage lender when you want to borrow more than 80% of the value of the property you purchase. This Lenders Mortgage Insurance (LMI) Calculator will help you to estimate how much LMI premium you need to pay. LMI can either be paid upfront or capitalised into the loan which means payments are made over the life of the loan. This Lenders Mortgage Insurance (LMI) Calculator not only estimate the LMI premium but also shows the difference in total repayment between capitalizing and not capitalizing the LMI premium. Here is a screen shot that will give you a better idea that what you need to do and how this Lenders Mortgage Insurance (LMI) Calculator can help you. This calculator is built in Microsoft Excel worksheet. You need to have Microsoft Excel 2007 & above and Microsoft Windows to use it. You may be able to use the calculator with other applications that can open and read XLS spreadsheets, but this has not been tested. Normally lenders will ask you to pay Lenders Mortgage Insurance (LMI) if your LVR is over 80%. If you are unsure about your LVR, you can use the free LVR calculator to calculate the LVR. 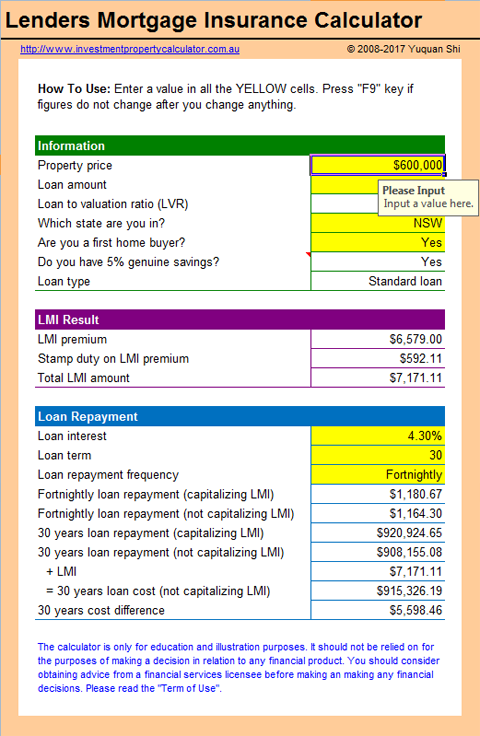 Download Loan to Value Ratio LVR Calculator Now!